Abstract. In this paper, we propose a new sub-grid scale parameterization for the ice discharge into the ocean through outlet glaciers and inspect the role of different observational and palaeo constraints for the choice of an optimal set of model parameters. This parameterization was introduced into the polythermal ice-sheet model SICOPOLIS, which is coupled to the regional climate model of intermediate complexity REMBO. Using the coupled model, we performed large ensemble simulations over the last two glacial cycles by varying two major parameters: a melt parameter in the surface melt scheme of REMBO and a discharge scaling parameter in our parameterization of ice discharge. Our empirical constraints are the present-day Greenland ice sheet surface elevation, the surface mass balance partition (ratio between total ice discharge and total precipitation) and the Eemian interglacial elevation drop relative to present day in the vicinity of the NEEM ice core. We show that the ice discharge parameterization enables us to simulate both the correct ice-sheet shape and mass balance partition at the same time without explicitly resolving the Greenland outlet glaciers. For model verification, we compare the simulated total and sectoral ice discharge with other estimates. For the model versions that are consistent with the range of observational and palaeo constraints, our simulated Greenland ice sheet contribution to Eemian sea-level rise relative to present-day amounts to 1.4 m on average (in the range of 0.6 and 2.5 m). 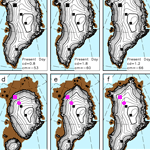 How to cite: Calov, R., Robinson, A., Perrette, M., and Ganopolski, A.: Simulating the Greenland ice sheet under present-day and palaeo constraints including a new discharge parameterization, The Cryosphere, 9, 179-196, https://doi.org/10.5194/tc-9-179-2015, 2015.